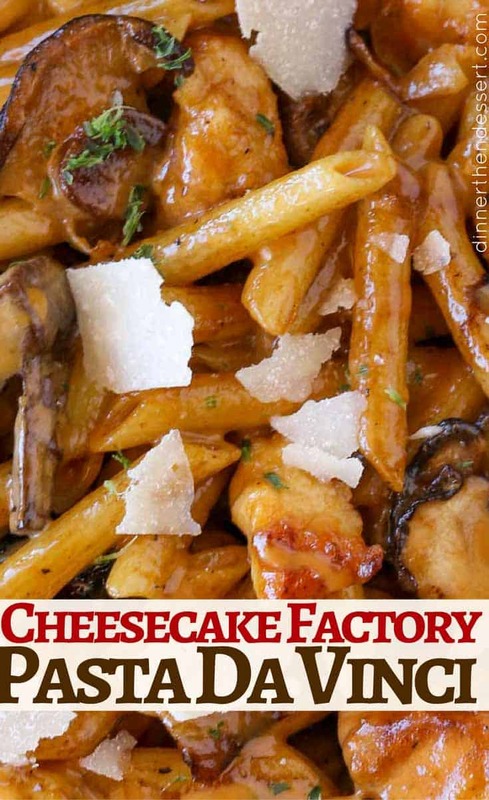 Cheesecake Factory Pasta Da Vinci with chicken and mushrooms in a creamy madeira wine sauce with Parmesan cheese. One of the most popular pastas on the menu! 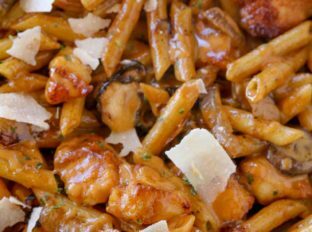 Pasta Da Vinci is a delicious and easy take on the more classic chicken madeira with a sweet wine based sauce with heavy cream. As with everything from The Cheesecake Factory this dish is bold on flavor and does not cut back on the cheese and heavy cream. 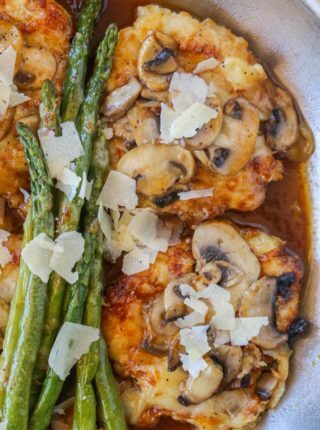 I also have a copycat for Cheesecake Factory’s Chicken Madeira if you love cooking with madeira wine! Don’t despair, while I am sharing the true copy I actually also lightened up the dish for us, so if you scroll down a bit I have a few easy swaps you can save calories with. What can I use instead of Madeira wine? This recipe calls for Madeira wine which can be difficult to find/expensive. Some substitutes are a dry port wine, Marsala, or a dry sherry wine. As a last resort I’d use stock with additional base mixed in. What can I use instead of Shiitake Mushrooms? Shiitake mushrooms are also more difficult to find and more expensive. They do have a unique flavor so if you swap them out please understand the flavors will vary. If you do, I recommend crimini mushrooms and I also recommend you brown them well to get the most flavor from them as possible. If you have mushroom base, I’d add a small spoonful of that in with your chicken stock too. Don’t cut the butter, this will keep most of the flavor. Use light or fat free sour cream. Use fat free half and half and use half the amount. Madeira Wine: Some substitutes are a dry port wine, Marsala, or a dry sherry wine. As a last resort I’d use stock with additional base mixed in. 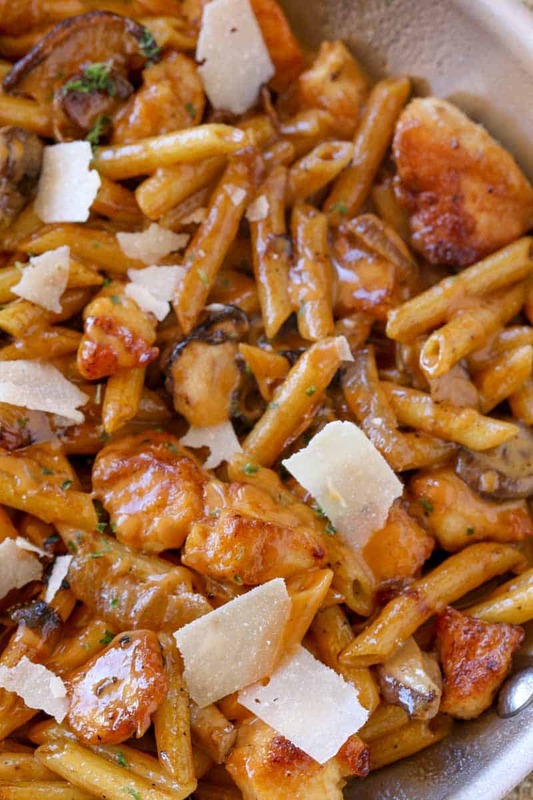 Cheesecake Factory Pasta Da Vinci copycat with chicken and mushrooms in a creamy madeira wine sauce with Parmesan cheese. 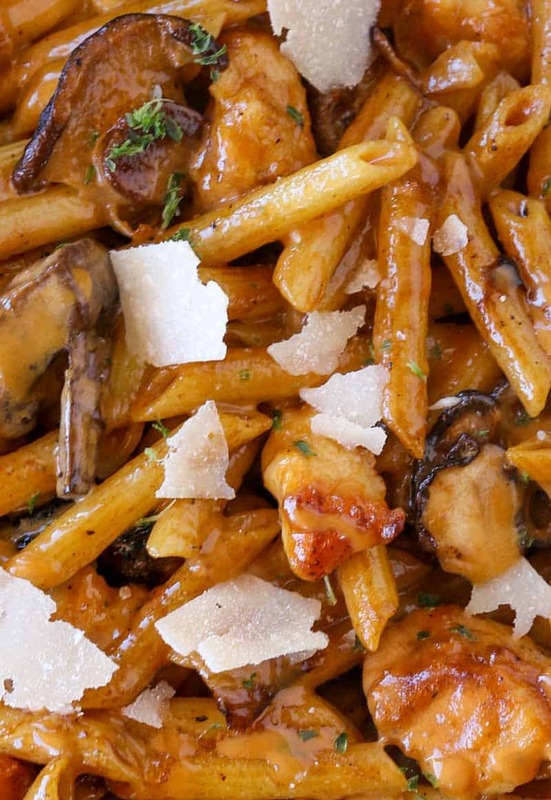 One of their most popular pastas! In a cast iron skillet add 1 tablespoon of butter. Add the chicken, salt and pepper in the pan on medium-high heat for 5-7 minutes, stirring once in the middle. 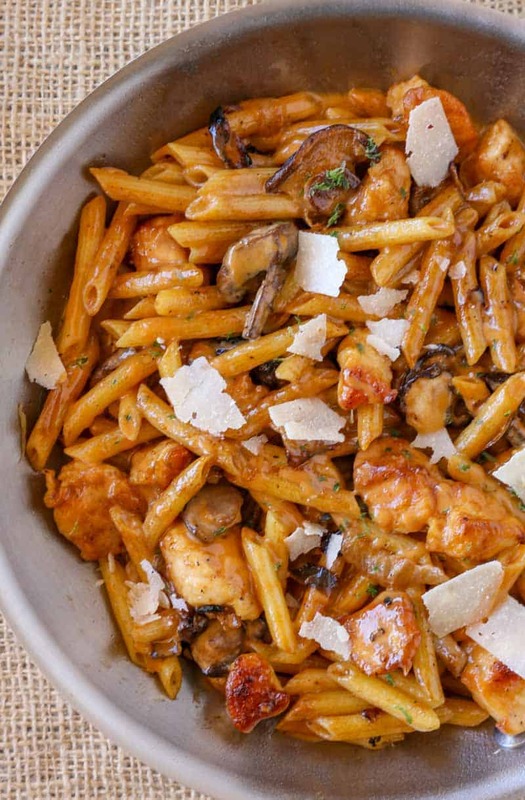 Remove the chicken from the pan and set it aside with the pasta. Add in mushrooms and cook until browned, 5-7 minutes. Add in 1 tablespoon of butter to the pan with the mushrooms and add your onions. Cook on medium-low for 5-7 minutes or until caramelized. Add in the garlic and cook one additional minute. Add the wine and 1 cup chicken broth and let reduce by 3/4 of the liquid (10-12 minutes depending on how hot the skillet and flame are). Add the sour cream, heavy cream, Parmesan cheese and final tablespoon of butter. Whisk until it is well combined. Add in the chicken and pasta and stir to combine. Garnish with additional Parmesan cheese if desired. Can you freeze sauce without noodles? I haven’t tested it but I think it would be ok. If you decide to try, I’d love to know how it turns out. Thanks! Love this copycat recipe. Thank you very much. Super good, pretty close to the Cheesecake Factory version. Add shrimp and it’s even better. Thanks for the 5 stars, Johnny! Hmmm, I’m not sure why it would be salty especially with leaving out the salt. Are you using salted butter by chance? I’m so glad you enjoyed it, Justine! I really appreciate the 5 star rating. It was delicious but no quite like the actual dish, maybe less cream next time. Has anyone made this without the chicken broth? I found a very similar recipe on a different website with the exact same recipe minus the chicken broth. 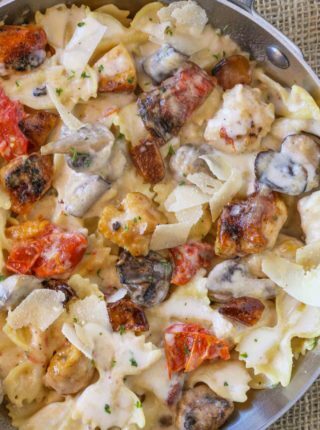 I feel like it would be less watery without it and I plan on making this tonight ! The taste is very close but the consistency is off. CF is more of a glaze while this is more of a liquid cream sauce. Very very good. This is my fave dish at CF! And I love that you gave lightened up options. Thanks Lauren! Now you get to enjoy it at home too! My family loves pasta for dinner! I am sure they will love this! I sure do love a great pasta dish! This one looks amazing! What a great looking dish! I love a good pasta recipe! This is one of my favorite meals, I love how you added lighter ingredient swaps! How much Parmesan do you add? The ingredients dont say. So sorry about that. 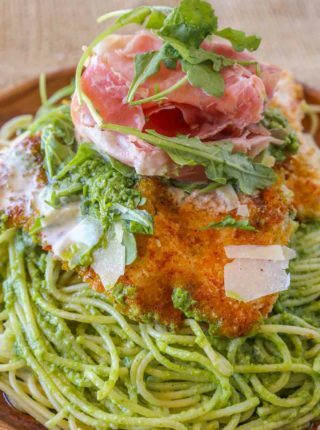 You’ll want to add 1/2 cup Parmesan cheese. I updated the recipe card to show it now. Thanks for catching that! Love copycat recipes! Thank you for this! 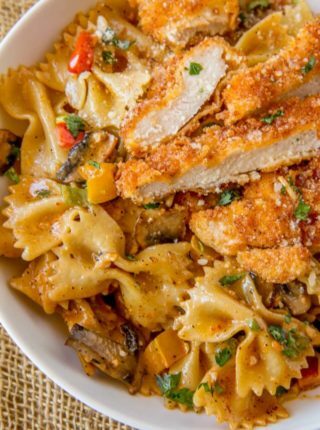 This pasta looks so delicious! Love it! I love this dish! The Cheesecake Factory is one of my favorite resturants that has never disappointed. I had a piece of pumpkin cheesecake before work on Monday, hehe. It’s so tempting. Pinning this recipe so i will be prepared the next time a craving strikes.